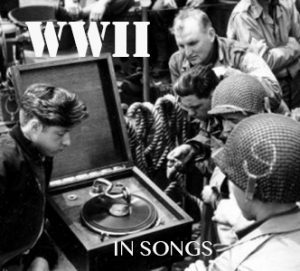 This song is actually not about the World War II, it wasn’t even sung back in those days. The song was the theme to the movie ”War and Peace” from 1956. It tells the story of a girl from Novgorod (in Russia). When war, here the French invasion of Russia (AKA the Russian Patriotic War of 1812), reaches her city she has to say goodbye to her loved one and she never sees him again. The second world war came to Novgorod in 1941. Apart from the human loss, Novgorods historic monuments were systematically annihilated and when the Red Army liberated the city in 1944, fewer than forty of the 2,536 stone buildings remained standing. Meanwhile Zarah Leander was, if not the biggest, then one of the biggest stars in Germany. A singer and an actress. She came from Sweden, but reached popularity across Europe, especially in Scandinavia and eventually Germany. So she moved there and eventually ended up working for the state-owned UFA (a German film and television production company). By then UFA was a subordinate to the Third Reich. Her films and lyrics were viewed by some as propaganda for the Nazi cause, although she took no public political position. Later she said she was ”Politically naive” at the time. Here’s one of her songs from her time in Germany. It translates to ”Can love be a sin?” and was written by her good and very homosexual friend Bruno Balz. Homosexuality was of course forbidden in Germany. After a bomb raid on her home in Berlin she returned to Sweden. Where she not was regarded as a traitor and nazi, after all her work in Germany. It took several years before she could make a comeback in Sweden, and even then she would remain a figure of public controversy. In fact it would haunt her for the rest of her life. Eventually she returned to performing throughout Europe, but was unable to equal the level of success she had previously achieved. She spent her later years in retirement in Stockholm, and died there at the age of 74. Propaganda Minister Joseph Goebbels dubbed her an ”Enemy of Germany”, but as a leading film star at UFA, she participated in ten films, most of them great successes. Leander neither socialized with leading party members nor took part in official Nazi Party functions. A likely apocryphal meeting with Goebbels supposedly resulted in this exchange: ”Zarah… Isn’t that a Jewish name?” ”Oh, maybe”, she said, ”but what about Josef?” ”Hmmm… yes, yes, a good answer”, Goebbels reportedly replied. A Soviet intelligence officer on the other hand claimed that Leander had in fact been a Soviet agent with the codename ”Rose-Marie”. Leander herself denied any suggestion that she had acted as a spy for any country but ”I would not be surprised if they claimed I were spying in Iceland on behalf of the Vatican”. Leander continued to be popular in Germany for many decades after World War II. She was interviewed several times in German television before she died. In 1983 New Wave singer Nina Hagen, who had idolized Leander as a child had, released the single ”Zarah”, based on ”Ich weiss, es wird einmal ein Wunder geschehen”. I’m thinking how hard it must have been to stand up to that regime. You could but you would probably die. Which leads me to the ”White Rose”. 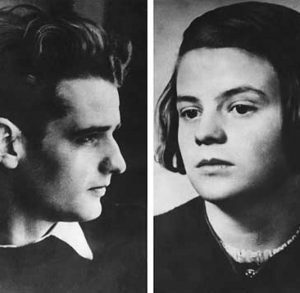 Hans and Sophie Scholl. Somebody should make a movie about them. The white rose was the best known resistance group in Germany. Before the war and 1933 you had the social democrats and the communist but by 1939 they were all gone. The roses were run by a small group of university students in Munich and their activities started in June 1942. They produced anonymous leaflets, calling on intellectuals and professionals to unite and stand against the Nazi regime. In total, the White Rose authored six leaflets, which were multiplied and spread, in a total of about 15,000 copies. They branded the Nazi regime’s crimes and oppression, and called for resistance. In their second leaflet, they openly denounced the persecution and mass murder of the Jews. On 3rd, 8th, and 15 February 1943, Alexander Schmorell, Hans Scholl, and Willi Graf used tin stencils to write paroles like ”Down with Hitler” and ”Freedom” on the walls of the university and other buildings in Munich. The Gestapo spent weeks searching for the creators of the White Rose pamphlets. In February 1943 a tip-off led to the arrest of three students, including 21-year-old Sophie Scholl and her 23-year-old brother Hans. They were interrogated, tortured, tried and executed – all within six hours. More arrests and executions followed over the coming weeks. The final White Rose pamphlet was obtained by the Allies, who re-printed it and dropped by air all over Germany.